Soldiers of 1st Platoon, B Company, 2nd Battalion, 327th Infantry Regiment, 101st Airborne Division, with sniper-scout attachments, fly aboard a CH-47 Chinook helicopter en route to an objective in Iraq on August 30, 200. Units: The division includes three brigades plus two aviation brigades, an artillery unit and several supporting units, totaling 20,000 soldiers. Duties: The 101st Airborne, known as the "Screaming Eagles," patrols northern Iraq, including the city of Mosul. It was relieved by the 1st Infantry Division, the 30th Infantry Brigade and the 2nd Infantry Divison's 3rd Brigade in March 2004. The division bills itself as the "only air assault division in the world" and has the ability to conduct air assault operations and long-range helicopter assaults. The division is armed with 270 helicopters, including thee battalions of Apache attack helicopters. 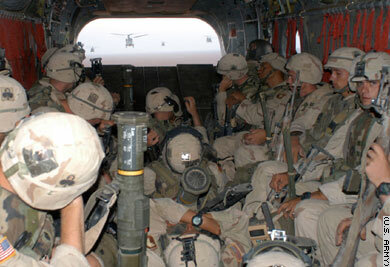 In Afghanistan, the 101st Airborne soldiers fought in Operation Anaconda, the March 2002 battle in the Shah-e-Kot valley. Apache helicopters from the 101st Airborne fired the first shots in the Persian Gulf War, destroying Iraqi early-warning radar sites 22 minutes before the air war began on January 17, 1991. The 101st Airborne also penetrated deep into Kuwait to cut off Iraqi forces fleeing toward the Iraqi-Kuwaiti border. EDITOR'S NOTE: CNN's policy is to not report information that puts operational security at risk.